We’d love your help. Let us know what’s wrong with this preview of The Inflamed Mind by Edward Bullmore. To ask other readers questions about The Inflamed Mind, please sign up. Pre-ordered this on Amazon and it arrived at 10am this morning. This is the book I've been waiting for and this is the book I hoped it would be when I pre-ordered it. Everyone should read this book... as everyone will be touched by depression/anxiety at some point in their lives - either personally or themselves know someone else with mental health issues. Everyone should read it... including GPs. Anyone reading this who has at some point battled with depression themselves (an Pre-ordered this on Amazon and it arrived at 10am this morning. Anyone reading this who has at some point battled with depression themselves (and on average that will be 1:4 of us) will be struck I think, by page 72. GPs still "test" you for depression or MDD with a basic tick box list... DESPITE you perhaps presenting chronic or even acute physical symptoms. This is infuriating at best for the patient... and deeply, deeply flawed at worst. In my own case I certainly became exasperated and depressed by a "grumbling" chronically-inflamed appendix and doctors passing it off soley as 'stress'. The worst question to answer in my own MDD test was the "Are you taking less pleasure in activities that you previously found pleasurable?" I looked at my GP and said "It's not that I'm taking less pleasure from my physical hobbies... it's that I'm taking NO pleasure from them... as I CAN"T do them (golf, running etc) as I double up in physical pain when I do." But I had no 3rd option on my test. I had to put "I take less pleasure..."
2 months later and I had an emergency appendectomy. I'm sure our hard-working GPs know the basic MDD test is very flawed. I hope so. Another horrible revelation for readers will be Bullmore's insistence that physiological scientific knowledge of mental health issues hasn't really moved on since the late 80s with the introduction of Prozac. I remember speaking to two GPs a good few years ago now about my reluctance to go onto SSRI antidepressants as I didn't think the resulting chronic feeling of low level despair, the probable impotence and the balloon in weight would be worth any mild improvements that the pharmaceutical might (repeat MIGHT) make. I am a scientist by qualification myself and didn't see any huge leaps in antidepressant effectiveness (or reduction in horrible side effects) in a couple of decades. The GPs insisted all antidepressants HAD come on over those 20 years... but Bullmore confirms otherwise. We're still basically probing around in the dark. That's... so.... well.. for want of another word... depressing. The worst revelation of all in the book though comes on page 184 - but it's a revelation that many of us that either have been troubled with depression or know family members who have, know all too well. It's a fact that if you have (or have had) a chronic mental health issue, you're likely, on average to live at perhaps 10 or 15 years LESS than if you've not managed a mental health issue in your life....and no... this is NOT because of suicides skewing the figures. It's because of something far more alarming than even that. Even when suicides are taken out of the "life expectancy equation", your average mental health "battler" still, on average, lives 10 years less than someone who hasn't battled a chronic mental health issue (be that depression/anxiety etc). This is basically because once you are even tentatively diagnosed with something like depression by your GP - you card is well and truly marked -or at least it feels like that to many, many patients. Dare to go again to your GP and complain of real physical symptoms - and the standard position (often) from your GP will be "it's all in your head". You're FAR more likely to die of a treatable, physical illness or disease if you have "depression" in your medical records. You could argue (with some fortitude) that is actually because the your GP truly believes your physical symptoms really ARE "all in your head". Or... they don't actually believe you at all when you dare to say "Doc... I really do think I may have something very wrong with my liver/gut/lung/joints/thyroid..." etc etc. This, I think, is a NATIONAL DISGRACE. I say "National" as I think even our European neighbours do better at this sort of thing than we do. Our entire health system needs to join-up mental and physical health issues, diagnosis and treatment - but even now we basically treat them as completely separate things. And that is something that the rest of the world does seem to be streets ahead of us in. I'm not saying GPs don't care (although some of mine I'd suggest could benefit from a course in "listening to" (or even "looking at"!) their patients). And I am aware that some GPs DO look to "prescribe" exercise or a change in diet etc to look to any physical roots of mental ill health - rather than immediately reach for the Prozac prescription form. But very often one is pushed towards a bit of a box tick such as CBT - even when that COULDN'T work for some physical inflammatory symptoms - and then the chain of trying out SSRIs if CBT has no lasting effect. I also know (very well indeed) that some "traditional" or "accidental" antidepressants such as SSRIs DO work for many people and enable them to function. (Without which they couldn't). But they simply don't work for many other people because they CAN'T... and we STILL don't have a clear picture about the importance of serotonin (or adrenaline or noradrenaline) in this complicated field... despite what many GPs (blindly) insist. The well-qualified Bullmore makes such a lot of sense in this book, at least to me. Perhaps this will go some way to begin to eradicate any stigma of mental ill health too. Even if you're on (or have been on) an SSRI and thought it DID make a difference to you or you know someone who is (or was) - I'd certainly HIGHLY recommend this book. I am a psychiatrist and have not only seen hundreds of patients with depression, but also experienced it for several years. Dr Bullmore belongs to the same professional organisation as myself: the Royal College of Psychiatrists. He has worked half-time for a large British pharmaceutical company since 2005. I think the starting point about interventions for depression is that most people just need good support. One problem has been that 'support' is often seen as a low-cost option, while different I am a psychiatrist and have not only seen hundreds of patients with depression, but also experienced it for several years. Dr Bullmore belongs to the same professional organisation as myself: the Royal College of Psychiatrists. He has worked half-time for a large British pharmaceutical company since 2005. I think the starting point about interventions for depression is that most people just need good support. One problem has been that 'support' is often seen as a low-cost option, while different brands of therapy (whether 'talking' or drugs-based) market themselves, often dubiously, both within the NHS and in private practice. In recent years it has become clear that fewer than 1 in 10 people who are prescribed current 'antidepressants' have a real drug-based response. There are also more serious problems, with side effects and withdrawal, than patients are usually informed about. We should keep an open mind about whether some people have 'inflamed' depression, but for me the way Dr Bullmore outlines it reduces his credibility. He gives a distorted account of current 'anti-inflammatory' drugs, highlighting aspirin rather than those with fewer side effects such as ibuprofen. His account of the reasons why such drugs have not been tested, and of the pharmaceutical industry, is not convincing. This one comes under the category of "books I won't read", but you have to say you're going to, to post at Goodreads. So. "The cover of “The Inflamed Mind” should immediately arouse a reader’s suspicions about the reliability of what lies within. The subtitle promises “a radical new approach to depression,” and the front flap of the dust jacket claims this is a “game-changing” book that “reve This one comes under the category of "books I won't read", but you have to say you're going to, to post at Goodreads. So. My mind was further inflamed, so to speak, when I saw a cover endorsement by the CEO of “Mindstrong Health,” a company aiming to develop ways of measuring biomarkers for mental illnesses. On the back flap, we learn that the book’s author, Edward Bullmore, a professor of psychiatry at the University of Cambridge, is “currently leading an academic-industrial partnership for the development of new anti-inflammatory drugs for depression.” ... Even “Listening to Prozac” did not have a cover endorsement from the CEO of Eli Lilly. The idea that inflammation is involved in some mental illnesses is not an improbable hypothesis. But the evidence that it’s a significant cause of most kinds of depression comprises a relatively small part of Dr. Bullmore’s narrative, which is puffed to book length with chapters on how the immune system works [etc]"
Really, need you read more? Avoid, avoid. At least at this stage. This book should be added to the set reading list for all trainee doctors and clinicians with immediate effect. It should also be available at all mental health charities. All libraries both university and public. It should be made available to anybody who works with children whether as a support worker or teacher, but more importantly for anybody who is a sufferer of mental health issues or who is a carer of one (I am both) please read this book. For all those who sit on charitable commissions, This book should be added to the set reading list for all trainee doctors and clinicians with immediate effect. It should also be available at all mental health charities. All libraries both university and public. It should be made available to anybody who works with children whether as a support worker or teacher, but more importantly for anybody who is a sufferer of mental health issues or who is a carer of one (I am both) please read this book. For all those who sit on charitable commissions, House of Lords and Commons Mental Health Committees, Mental Health Hospital Trysts, CEO’s of Hospital Trusts and anybody who has a voice or any say in this country’s current care/treatment of those suffering from mental health issues my plea to you all is please read this book. GP’s, Home Treatment teams for Mental Health please read this book but to those psychiatrists coming through their training now to you most of all please please read it and think outside of the box. Mental health continues to be a topic where those that suffer and those that have been lucky enough to come through depression are still in the shadows but we too have a voice and it’s one that should be listened to. If you buy one non fiction book this year please consider this one. Thank you Professor Bullmore for being brave enough to speak out. THE INFLAMED MIND: A RADICAL NEW APPROACH TO DEPRESSION shares groundbreaking research into the role of the immune system and inflammation in the development of depression. Edward Bullmore, among the first animmunopsychiatrists, shares the pioneering work being done in clinical neuroscience that impacts not only depression, but also schizophrenia and Alzheimer's disease. He describes the significant link between systemic inflammation and mental illness, heralding a new field of personalized psychiatry, much in the way personalized therapy has revolutionized cancer treatment. He also identifies new anti-inflammatory treatments for depression, projected to be the single biggest cause of disability in the next twenty years. As Jeremy Vine of the BBC says, “Suddenly an expert who wants to stop and question everything we thought we knew…This is a lesson in the workings of the brain far too important to ignore." Highly recommended! Thanks to Macmillan-Picador and NetGalley for the review copy. Opinions are fully mine. Phenomenal. I wanted to pull my hair at times over the descriptions of psychological explanations of depression, but, big but - the most satisfying book on depression I have ever read. Very uncomfortable reading this on the tube to work and then having to use CBT to treat depression when I got there. It's not enough. A must read for anyone interested in depression, for anyone who has or loves someone with a long term health problem. Please, someone I know, read it Phenomenal. I wanted to pull my hair at times over the descriptions of psychological explanations of depression, but, big but - the most satisfying book on depression I have ever read. Very uncomfortable reading this on the tube to work and then having to use CBT to treat depression when I got there. It's not enough. The author has some interesting proposals, but he overreaches. Though I think he makes a decent case that inflammation is involved in depression, he pushes for it to have a central role on thin evidence. The book is also padded with tangents on Descartes, the immune system, and evolution - fairly basic stuff, as in white blood cells drawn as Pac-Men. I was uncertain whether to lean toward the good parts or the weaker parts, but if Carol Tavris rated it two stars, I'll go with her. His book is a summary of the most recent research linking depression to physical inflammation. I found it absolutely fascinating. Bullmore’s suggestion is that patients are not simply depressed because of their physical symptoms, but that their depression is Professor Edward Bullmore is Head of the Department of Psychiatry and the Director of the Wolfson Brain Imaging Centre in the Department of Clinical Neurosciences at the University of Cambridge and a part-time consultant for GlaxoSmithKline. I found it absolutely fascinating. Bullmore’s suggestion is that patients are not simply depressed because of their physical symptoms, but that their depression is part and parcel of their physical symptoms. He is excellent at explaining scientific terms to a lay audience, and there are a lot of helpful diagrams illustrating what is going on inside the human brain. For me, this was a page-turner. 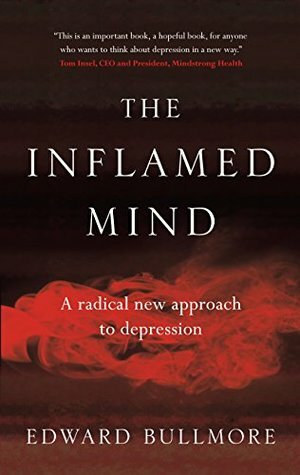 The Inflamed Mind: A Radical New Approach to Depression is written by psychiatrist Edward Bullmore, and presents inflammation as a new frontier in tackling depression. The author's bio at the beginning of the book reveals that he works at pharmaceutical giant GlaxoSmithKline. He doesn't try to be subtle about disclosing this, and I didn't pick up any sense of bias. He explains that in 2010 GSK shut down its mental health research and development (R&D) programs, and this was what prompted The Inflamed Mind: A Radical New Approach to Depression is written by psychiatrist Edward Bullmore, and presents inflammation as a new frontier in tackling depression. The author's bio at the beginning of the book reveals that he works at pharmaceutical giant GlaxoSmithKline. He doesn't try to be subtle about disclosing this, and I didn't pick up any sense of bias. He explains that in 2010 GSK shut down its mental health research and development (R&D) programs, and this was what prompted him to start thinking seriously about neuro-immunology and the role of inflammation. The author refers multiple times to an anecdote of his experience of social withdrawal and morbid rumination immediately following root canal surgery. It was gone by the next day, but he wrote "you could say I had been a bit depressed", and attributed this to inflammation related to the surgery. While I understand the point he was trying to make, as a person living with depression myself I couldn't help but roll my eyes. Cartoon drawings are used effectively to capture neuro-immunology concepts. Explanations are given in simple terms, without making the mistake of sacrificing accuracy for metaphor. Scientific terms are used, such as the immune cells known as macrophages, and the signalling molecules they release, called cytokines. While it's somewhat difficult for me to judge, as I was familiar with many of these concepts before reading the book, I think it was pitched to a level that a reasonably intelligent person could understand without having a science background. A patient referred to as Mrs. P. makes frequent appearances throughout the book. The author encountered Mrs. P. during his medical training. She had rheumatoid arthritis as well as depressive symptoms, but her treating physician insisted that the depression was a normal psychological reaction to her physical disease. It was a relevant example, but it struck me as a bit over-used. There was what initially felt like a bit of a detour to philosopher René Descartes to explain the persistent idea of separation between mind and body. However, Descartes ended up appearing even more often than Mrs. P. did, to the point that it got to be a bit much. The author writes "I can fondly imagine that Descartes himself might have agreed with me, but I can't be sure." Oh my. He did make the interesting point, though, that the mind/body divide is a sort of "medical apartheid", and I very much agree that a more holistic approach will better serve patients. Bullmore argues that placing depression solely within the mental domain actually serves to increase shame and the likelihood that people will think the illness is their fault, which is in many ways what the idea of a "chemical imbalance" tries to counteract. He goes on to explain the shortcomings of the serotonin hypothesis, which was used as the basis for the development of selective serotonin reuptake inhibitor (SSRI) antidepressants. He also explained that approaching depression with a focus on serotonin and related neurotransmitters has stalled out, and there have been no major advances in the treatment of depression since around 1990. He writes: "To this day, in 2018, I could still safely and acceptably treat most patients with mental health disorders based solely on what was written in those those textbooks" that he used when he started his specialty training in 1989. While I understand the underlying point that there haven't been any revolutionary advances in psychiatry, the notion of seeing a psychiatrist whose knowledge base is rooted in 1989 is unpalatable, to say the least. The book explains that according to the DSM: "According to the official diagnostic criteria of the American Psychiatric Association, depressed patients can only have a diagnosis of [major depressive disorder] if they do not also have a bodily disease." Based on this, he concluded that Mrs. P. who had rheumatoid arthritis couldn't have a depression diagnosis. To me this interpretation seemed a bit odd. The exact wording in the DSM-5 is: "The episode is not attributable to the physiological effects of a substance or another medical condition." The possible relationship between depression and evolution is discussed. The author explained that back in the caveman days social withdrawal could have been a form of quarantine to prevent infectious disease, adding that: "One might even wonder if the stigmatization of depression in 2018 is somehow related to the isolation of ancestral tribe members who were behaving as if they were inflamed." That seems like a bit of a leap, and is followed by yet another leap: "Could the common feeling that 'we don't know what to say' to our depressed friend conceal an ancient inherited instinct to recoil from close contact with people who are behaving as if they are inflamed and infectious?" By that argument, though, why is there not such a social recoil from people with type I diabetes or Crohn's disease? Or the oft-referred-to Mrs. P. with rheumatoid arthritis? While there is a strong argument that inflammation is a factor in depression and an important target for research, there isn't much yet in practical terms. The book describes the "Remicade high" that some clinicians have seen in patients who rapidly cheered up while getting an infusion of that anti-inflammatory medication. There have been some small studies with anti-inflammatories that have had positive results, but there isn't a clear indicator of something particularly effective that's available right now. Vagal nerve stimulation is also mentioned as a possible intervention to target inflammation. Cytokine receptors on the vagus nerve respond to high levels of inflammation by signalling to the spleen to deactivate macrophages in order to maintain homeostasis. I started this book quite prepared to buy what the author was selling, given my prior knowledge of some of the research in this area. I was a bit surprised by the book's presentation of the idea as though it's something that everyone is denying, because it's sufficiently accepted to have made its way into the mainstream continuing medical education activities that I've viewed. Bullmore writes that "we could be on the cusp of a revolution", and I know personally I'm hoping that advances in anti-inflammatory treatment approaches will end up being able to help with my own depression. The book makes a strong argument that further research into inflammation is going to open new doors in depression treatment. However, the fact that we don't have keys to those doors yet limits its practical usefulness. Still, this book is worth reading if you're interested in finding out more about a new way of looking at the biology of depression. Interesting and exciting stuff laid out in a pretty accessible way for the layperson and lots of cute and entertaining anecdotes to lighten it up a bit. I found it a fascinating historical tutorial/ overview of various drug and other treatment modalities which even my chemist husband isn't aware of. But it's a bit grim/depressing at the end (there's no real help right now) and I was disappointed at the focus mainly on drug development and not on things like embodiment practices and expressive ar Interesting and exciting stuff laid out in a pretty accessible way for the layperson and lots of cute and entertaining anecdotes to lighten it up a bit. I found it a fascinating historical tutorial/ overview of various drug and other treatment modalities which even my chemist husband isn't aware of. But it's a bit grim/depressing at the end (there's no real help right now) and I was disappointed at the focus mainly on drug development and not on things like embodiment practices and expressive arts. Barely a mention for mindfulness or T'ai Chi etc. STill, I guess it's a revolutionary book for a classically trained psychiatrist and it gave me some food for thought. And a smidgeon of hope that things will shift in the right direction, and faster than previous developments. I've just finished reading another book about PTSD, which looks at PTSD as a form of umourned grief and thus, not an illness at all (and it's not a big leap to say that a huge number of people with PTSD symptoms also are locked in a battle with depression) and this idea has a lot of merit as well. I've just revised my review down by a star, because of the emphasis pharmaceuticals as the magic key, and having read some other reviews by people in the field. However, *all* medically trained persons who are not questioning the dichotomy of mind vs. body and actively promoting a discussion as to how we can erase this divide are suspect to me. I think Dr. Bullmore's discomfort with this Cartesian divide which has permeated the medical industry is what endeared his book to me in the first place. Still a good source of food for thought, but an incomplete and biased one perhaps. Historically the medical world has treated the brain and the body separately as per the teachings of Descartes. We still do. And we do it in completely separate hospitals. If the body is under attack it becomes inflamed as white blood cells and macrophages overreact and nuke the infection site, but what about the brain? Is it possible for a root canal to cause a couple of days of depression? Is the blood brain barrier permeable? This is the question that got the author thinking. But under US conve Historically the medical world has treated the brain and the body separately as per the teachings of Descartes. We still do. And we do it in completely separate hospitals. But under US conventions, a person cannot be diagnosed with a Major Depressive Disorder if they have a chronic illness. And it seemed to him that people with early onset arthritis were depressed and NOT because they had a chronic illness. With tech advances we can put people under a fMRI and see how stress / sadness / empathy affects their brains so we can see the links. We also know that people under stress have increased inflammation, and if inflammation causes depression, which causes more stress… then around the cycle you go again. When they test teachers before they do public speaking, their macrophage levels are extremely high. Test them afterwards and the levels drop, but are still high, because teaching is a stressful vocation. Add one more thing to their list of things to do, and you get burnout and resignations. Consider also that depression can have social consequences. Relationships with friends and partners suffer, patients may lose income or jobs, and become reliant upon social security. All of which increases stress. Especially if you are hospitalised; people can ‘lose’ months of their lives. From the Dunedin study, we also know that children who grew up in poverty (food / health stress) or were abused (physical stress) are more likely to suffer Depression as adults. The body remembers. And it leaves you on a knife edge. One of his patient’s abuser died, and that caused a whole can of worms to be opened. We now know that a stressful life event throws a rock in the pond of the immune system, causing major changes in how all the different types of immune cell are working and interacting with each other. Sadly, most pharmaceutical companies are not interested in healing these days; they are interested in profit. And producing a pharmaceutical that works via a daily dose to manage an illness is a better business choice than healing that illness altogether. That HAS to make a difference to what they invest research dollars in. And as he points out, it’s a LOT of money - estimated at $850 million to get a drug from concept to shelf. I think we can all see that the current system of research is broken. I wanted to like this book. Bullmore is right, at least, in noting that “therapeutic progress [in psychiatry] has stalled in the last 30 years”, and that doctors still have little to offer other than SSRIs and talking therapies, helpful though they are to many people. The book is, however, full of contradictions and unsubstantiated claims. That bodily inflammation might cause a lowering of mood is an interesting enough theory but that is all it is. Bullmore fails to back this claim with any kind I wanted to like this book. Bullmore is right, at least, in noting that “therapeutic progress [in psychiatry] has stalled in the last 30 years”, and that doctors still have little to offer other than SSRIs and talking therapies, helpful though they are to many people. The book is, however, full of contradictions and unsubstantiated claims. That bodily inflammation might cause a lowering of mood is an interesting enough theory but that is all it is. Bullmore fails to back this claim with any kind of solid evidence and falls into the trap of making the facts fit the theory, which will never pass muster under scientific scrutiny. He points to a statistically significant correlation between depression and a raised CRP (marker for inflammatory proteins) in the blood and goes on to describe this as “robust evidence” but it is nothing of the sort. Correlations say nothing of cause and effect or of variables, of which there are a great many when it comes to raised levels of CRP. Bullmore rightly emphasises that depression has many causes – it is a symptom rather than an illness in its own right – yet he goes on to say that it really all boils down to inflammation in the end, including responses to minor events such as dental treatment or vaccination. To be clear, Bullmore is referring to clinical depression here and not just a bout of everyday fed-upness. But this claim leads to strange consequences. He states, for example, that older people are more prone to depression because of the inflammatory effects of ageing but this is not true. Depression generally lessens with age, which is why suicide rates are far higher in younger age groups. He states that it is not a diagnosis of chronic illness that causes depression but the inflammation, as if one is not quite reasonably cast down by this on psychological and emotional grounds. Finally, he claims that it is not major life events such as bereavement or redundancy that cause depression but some hidden inflammation due to stress. And this, I’m afraid, is just nonsense. Besides, if it were the case that inflammation caused clinical depression, we would have noticed it within the context of everyday life right across human history. There would have been a strong pattern of pronounced low mood following every cold, cough, infection, injury or surgical procedure. There is no such pattern. It is true that those who enjoy good physical health are less prone to depression, especially if they exercise regularly, but this cannot be extrapolated to an inflammatory theory of depression. This book is a red herring. I especially liked how the author describes many of the issues in slow progression in the state-of-art. All chapters are very interesting to read, except maybe chapter 3 and part of chapter 4. In the latter two, the discussion became a bit dull: too much history for me. But this dull part was more than compensated for by the great discussions on the immune system and its potential effect on depression in the other chapters. The author makes (to me) quite some suprising statements. I was fir insiance quite surprised by the following claim made by the author: i.e. the effect of stimulating the vagus nerve on the immune system. And as such its possitive effects of stimulating this nerve in e.g. autoimmune disease and depression. The author, a former employee of Glaxo, Smith, Kline , wrote this book to challenge the DSM 5's definition of depression. In short, the DSM 5 does not allow a clinician to diagnose major depressive disorder ("depression as we know it") if the patient has an existing bodily disorder. In the example used, the patient could not be diagnosed with depression - even though she exhibited all of the traits and characteristics - because of a previous diagnosis of Rheumatoid Arthritis. This is based on decades old research which blame depression on a chemical imbalance, also known as "the serotonin hypothesis." But what if the primary cause of depression, was actually due to an inflammatory process in the body? What if depression isn't just a condition of the mind, but one that has a physiological base? What if a hyper-active immune system was to blame for depression? All of these questions are answered in the book. This made me excited to look further into this fascinating subject! This book included helpful illustrations which helped explain the functionality of neuropathic transmitters and how they interact with cytokines. I must admit, there were several times I had to employ the services of "Google" to help ascertain the meaning of certain terms. But even THAT was interesting and educational! This was very interesting. The author explores the possibility that depression is linked to inflammation in the body, not just low serotonin levels, which aren't readily measurable. I am not a physician or psychiatrist by trade, but still found this very readable. I thought the chapter covering the evolution of genetic factors for strong inflammation response to survive infection and illness was particularly engaging. However, while the author mentioned obesity as one of many contributors to hig This was very interesting. The author explores the possibility that depression is linked to inflammation in the body, not just low serotonin levels, which aren't readily measurable. I am not a physician or psychiatrist by trade, but still found this very readable. I thought the chapter covering the evolution of genetic factors for strong inflammation response to survive infection and illness was particularly engaging. However, while the author mentioned obesity as one of many contributors to higher C-reactive protein (CRP) results, he did not discuss diet as a potential treatment at all, unless I missed it somewhere. In research exploring the link between spreading depression and inflammation, I would think there is a strong correlation between rising reliance on processed foods which cause inflammation, and the rising depression/Alzheimer's/dementia rates. Similarly, social stress was also cited as a potential source of increased inflammation, yet lifestyle changes were not explored. Dr Bullimore's research and clinal work has led him to support the hypothesis that chronic inflammation can, and does, lead to depression in some patients. Through the long history of psychiatry, psychology and psychotherapeutics since the days of Freud, there have been few breakthroughs in the treatment of people with depression, and no real insights into potential causes. We have serotonin-reuptake inhibitors (but they've been around since the 1990s) and more recently there’s cognitive behavio Dr Bullimore's research and clinal work has led him to support the hypothesis that chronic inflammation can, and does, lead to depression in some patients. Through the long history of psychiatry, psychology and psychotherapeutics since the days of Freud, there have been few breakthroughs in the treatment of people with depression, and no real insights into potential causes. We have serotonin-reuptake inhibitors (but they've been around since the 1990s) and more recently there’s cognitive behavioural therapy. But whilst these treatments do provide help to patients, this new avenue of thinking about the disease and its investigation may identify new therapeutic avenues and better remedies. The author makes the point that the traditional schism between 'somatic' medicine and psychiatry is one reason for the slow pace of progress and the reluctance of parts of the medical establishment to accept this new way of thinking. ‘So what’, they say, ‘if you had cancer/ rheumatoid arthritis/major surgery, well of course you’d be a bit down too’. Dr Bullimore makes the point that there is a rather more mechanistic immunological reason for this and that getting a handle on inflammation may lead to significant advances in the management of mental illness. Edward Bullmore's book is both amazing and disappointing. It's amazing because his writing is refreshingly clear as he lays out his thesis about inflammation's role in depression. He explains the nascent field of psycho-immunology and how much has been learned about the immune system 30 years. He also documents the weaknesses inherent in contemporary mental health-care, which is based on the ages-old Cartesian separation of mind and body. The book is disappointing, however, because any treatment Edward Bullmore's book is both amazing and disappointing. It's amazing because his writing is refreshingly clear as he lays out his thesis about inflammation's role in depression. He explains the nascent field of psycho-immunology and how much has been learned about the immune system 30 years. He also documents the weaknesses inherent in contemporary mental health-care, which is based on the ages-old Cartesian separation of mind and body. The book is disappointing, however, because any treatment based on the role of inflammation in the brain is still years away. Unfortunately, he also has virtually nothing to say about any other approach to lowering inflammation in the body. For instance, there are a variety of anti-inflammation diets out there, but Dr. Bullmore has no guidance to give. No doubt that is because there is no inflammation-reducing diet verified as effective through research. (At least to my understanding.) But it would have been helpful if he at addressed it. Regardless, any lay person interested in inflammation and the brain should find Dr. Bullmore's overview both accessible and educational. This book manages to explain a complex set of ideas which reveals the truth of how important immunology is to human health and disease. A few times I wondered why Bulmore was talking about philosophical approaches and ideologies of medicine from the 17th century but if you stick with the subject it adds much need background to why there has not been investment in mental health in the last 30 years, and makes his conclusions and predictions credible if not a little but optimistic. I appreciated t This book manages to explain a complex set of ideas which reveals the truth of how important immunology is to human health and disease. A few times I wondered why Bulmore was talking about philosophical approaches and ideologies of medicine from the 17th century but if you stick with the subject it adds much need background to why there has not been investment in mental health in the last 30 years, and makes his conclusions and predictions credible if not a little but optimistic. I appreciated the balanced argument in this book and didn’t feel like I was being hard sold on an idea. Inflammation causes depression... That's a new one. I think author had a lot of good points throughout the book and I think I got his point: we need to stop the current medication for depression and try to come with alternative treatments and that actual problem might be the inflammation, however it was really hard to get that it was what he meant. I hope it was. I'm not sure to whom this book is intended. For depressed person, it seems way too biological and it's basically ignoring everything el Inflammation causes depression... That's a new one. I think author had a lot of good points throughout the book and I think I got his point: we need to stop the current medication for depression and try to come with alternative treatments and that actual problem might be the inflammation, however it was really hard to get that it was what he meant. I hope it was. I'm not sure to whom this book is intended. For depressed person, it seems way too biological and it's basically ignoring everything else that might have happened in your life and blaming it on biology. Does this sound familiar? Though then in between the lines it's telling you to ditch the meds. As for doctors and any sort of medical professionals, the book didn't offer that much of scientificl reasoning. This was very odd to read - he sets out to convince you that depression is CAUSED by inflammation. I found the idea plausible and exciting. But he doesn't seem to have the research or data available to back him up, and he seems more interested in convincing you of how smart/right he is than he is interested in outlining next steps for the field. He also seems to be claiming that the industry is not interested in performing further research into different treatment modalities for depression and s This was very odd to read - he sets out to convince you that depression is CAUSED by inflammation. I found the idea plausible and exciting. But he doesn't seem to have the research or data available to back him up, and he seems more interested in convincing you of how smart/right he is than he is interested in outlining next steps for the field. He also seems to be claiming that the industry is not interested in performing further research into different treatment modalities for depression and says that it is fairly unlikely that a new drug, even if it were developed, would make it to market. I'm not sure how accurate this is, but if that's correct, I'm not sure what we're supposed to do with the concepts he has given us in this book. I would love to see more research done on this topic. The idea is plausible. I just need to see some actual studies done. This book presents very interesting theories and ideas about depression. How it's always been treated as a disease of the mind and as such considered separately from physical illnesses. But research is starting to indicate that perhaps in some cases depression could be a result of inflammation of the brain. The brain in times past was considered to be separated and protected totally from the body by the blood brain barrier, something that investigators are beginning to believe to be not as much This book presents very interesting theories and ideas about depression. How it's always been treated as a disease of the mind and as such considered separately from physical illnesses. But research is starting to indicate that perhaps in some cases depression could be a result of inflammation of the brain. The brain in times past was considered to be separated and protected totally from the body by the blood brain barrier, something that investigators are beginning to believe to be not as much of a barrier as originally thought. And if so, then what goes on in the body to cause inflammation can certainly affect the brain as well. This change in thinking and research could have a positive outcome for new treatments for a wide range of diseases thought to be caused by inflammation--heart disease, coronary artery disease, rheumatoid arthritis, and also cases of depression believed to be caused by these inflammatory diseases. It seemed plausible to me as a line for further research. "If my arm is broken I can at least count on the cheerful support of people around me. There will probably be an entertaining story to tell about how it happened, perhaps some thrillingly gory details to share, and other people will generally be happy to listen, to sympathise, to tell in return their own war stories, and to pass on their nuggets of medical advice. But if my mind is broken I can count on none of this. if I am depressed -- j It seemed plausible to me as a line for further research. "If my arm is broken I can at least count on the cheerful support of people around me. There will probably be an entertaining story to tell about how it happened, perhaps some thrillingly gory details to share, and other people will generally be happy to listen, to sympathise, to tell in return their own war stories, and to pass on their nuggets of medical advice. But if my mind is broken I can count on none of this. if I am depressed -- joyless, hopeless, sleepless and plagued by an incessant sense of worthlessness -- I am also much more likely to find myself on my own" (74). In study in Cophenhagen, those with highest CRP levels were also most depressed. Shocks to the vagus nerve to inhibit cytokine production by macrophages in the spleen, thus decreasing inflamation (132).